Whenever I'm out on trail, be it as a guide or someone out on my own personal backpacking trip, food is the number one thing hikers will chat about while in camp at night and in the morning. Whenever you see another hiker eating or drinking something it's common practice to chat about it and why they're consuming it. I hadn't been on trail for more than a week before I started noticing all the hikers drinking a breakfast concoction I had never seen before. While the drink had many names and variations (hiker mocha, ranger pudding, power breakfast...) my personal favorite was the Hiker Mocha. Who doesn't love a fancy coffee drink at the beginning of a long morning of hiking?! At first my Hiker Mocha was chocolate milk powder and instant coffee, but I quickly realized that sugar energy was just burning off quick and made my teeth hurt. I took a cue from those making the ranger pudding and switched to a chocolate protein powder. Switching to a protein powder, however, wasn't an easy task! Not all proteins are created equally. Some powders contained added sugars or the dreaded sugar alcohols (REALLY harsh on the stomach after a few hours). Some were kind of vague with wording like "proprietary blend", which I later found out means the ingredients aren't really disclosed and mixes of different ingredients are used. While hikers eat lots of sugars and processed foods, it's nice to get a break from stuff like that at least once a day! When we were at the hiker mecca known as Walmart we could find EAS 100% Whey Protein powder. I personally found Whey Protein easier to digest and it was much easier on my stomach than other brands with added sugars, which is why I chose this brand. I was also excited to learn you can purchase this powder online as well! This came in really handy for me when I was hiking near smaller towns where it was really difficult to find any types supplements on trail. In fact, buying this powder online is still my favorite way to do it! EAS 100% Whey Protein is easy to find and order on the Walmart website! EAS 100% Whey Protein is easy to find and order on their site! A Hiker Mocha is so great at breakfast because you can drink it hot or cold, which really comes in handy on those mornings when you don't want to have a hot coffee. Here are the easy-to-follow instructions for making your very own Hiker Mocha! With only three simple ingredients you have a yummy, protein-filled breakfast drink! In your cup, measure out the first three powdered ingredients and mix together. Add in a few tablespoons of water to make a slurry. This will help equally distribute the ingredients and prevent any type of clumping of the milk powder. Slowly add 8-10 ounces of water, hot or cold, to your cup. Add honey or sweetener of choice if desired. Stir well and enjoy! The three powdered ingredients together - super simple! Alternatively, you can also make this mix in a Nalgene or similar bottle by adding the powdered ingredients and all the water with the optional sweetener at the same time. Shake well until ingredients are well-combined and the drink is smooth. Enjoy while sitting in camp or on the go to get in those morning miles! Easy to mix at home and drink on the go! I found that I not only felt better with protein in my system on trail, I also was able to hike stronger in the mornings without those nasty sugar crashes that tend to come on around mid-morning. Getting my energy from breakfast containing 30 grams of protein worked well for me! 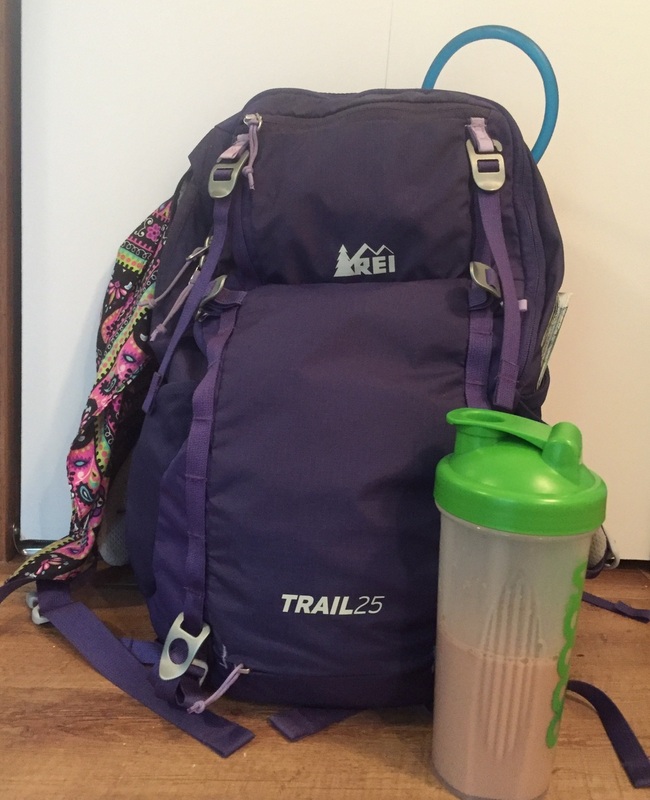 Have you ever tried drinking a protein drink either on trail or before a long hike? Tell me what you think about adding a supplement to your diet during physical activity. Leave me a comment below! You can find out more about EAS 100% Whey Protein by clicking here. Check out the New NBC Show S.T.R.O.N.G where EAS® products will be featured on the June 2nd episode. (9pm EST 8pm CST). For those of you using Ibotta, you can earn $3 on EAS 100% Whey Protein by clicking here. Older PostDoes a Hiker S*%! in the Woods? All content on this site is written by Jen "Sprinkles" Kelley and should not be reproduced without permission. Feel free to link to us!